One of my absolutely favorite things to wear to work is a printed skirt. When I first started working I had two basic & super functional pencil skirts – one black and one grey. Since I had a good set of basics in my work wardrobe, I started to branch out and I bought a polka-dot patterned pencil skirt. At the time I was really unsure if I would actually get that much use out of such a ‘fun’ work skirt. Wouldn’t I get tired of the skirt’s pattern pretty quickly and end up just wearing my neutral ones instead? This outfit starts with a fun printed skirt. (I said black & white print but it could really be any neutral & white pattern.) 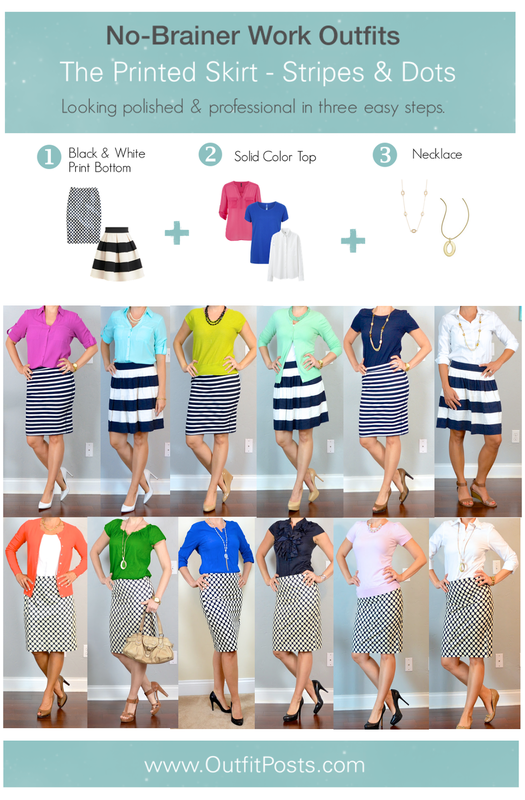 First, for the bottom, choose your printed skirt. My favorite prints are stripes and polka-dots but other examples might be a cool geometric pattern or pretty floral print. Next add a solid color top. Any color that you are drawn to and like to wear. (You can see I have almost every color of the rainbow above.) 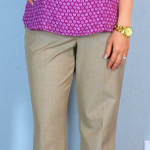 It can be a basic blouse or bonus points for texture with a tie-neck or ruffle on the shirt. Finally, I add a fun necklace in a metal or matching color to my top to break up the solid color on top. Nothing too crazy because I already have a print on the bottom. Just something to add some interest. Easy peasy professional. I have a very specific black trousers/patterned top combo “uniform” for work. I've bought a patterned skirt but I only have one colour block top! Got to work on that. I love this and as a pear shaped gal, I think I'm gonna try to flip it around to wear a solid (in my case darker) skirt, black and white patterned top, and a necklace. Thanks for the inspiration. I'm the same way when it comes to tucking in, but my favorite trick is to use a belt to create waist definition in lieu of a belt. Since I have fairly wide hips, broad shoulders and a short torso, I use a wide elastic belt in a variety of color/metal combos to give me that definition of tucking a shirt in without the dreaded “extra tummy” look. 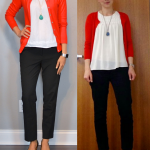 Additionally, depending on where I wear the belt can change the shape of the shirt to accommodate a pencil skirt, full skirt, skinny pants or wide leg trousers. Hope that helps!